The Paris climate agreement will survive a Trump presidency says the US special envoy on climate change Dr Jonathan Pershing. He was speaking before the arrival of ministers and some heads of state in Marrakech on Tuesday. 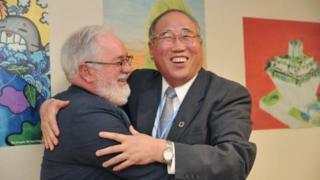 They are coming to try to take the next steps to tackle global climate change. But the meeting has been rocked by the possibility that President-elect Donald Trump will withdraw the US from the pact. US lead negotiator Dr Pershing told a packed news briefing that the passion and dedication displayed in the effort to deliver the Paris treaty was strong enough to withstand the impacts of a Trump presidency. “Heads of state can and will change but I am confident that we can and we will sustain a durable international effort to counter climate change,” he said. Dr Pershing said that he expected personnel from the Trump transition team to start arriving at the State Department in the coming weeks and they would drive the “shape and thrust” of US diplomacy over the next four years. On the campaign trail, Donald Trump sketched a plan to “cancel” the Paris Agreement and withhold US payments to the UN body tasked with stemming climate change. He has also appointed Myron Ebell, from the Competitive Enterprise Institute, a man well known for his contrarian views on climate change, to head his Environmental Protection Agency (EPA) transition team. Dr Pershing said that he had no information on who might lead on climate change issues in a Trump administration. Whoever it was, he said, should recognise the strength of last year's climate agreement and what it could help the world to achieve. “The Paris agreement protects economic growth and the environment, all while providing nationally determined flexibility to accommodate differing circumstances,” he said. Negotiators from across the globe have been reluctant to directly criticise the incoming US administration. They have instead opted to focus on the benefits to economies of a transition to greener sources of energy. The EU climate commissioner Miguel Arias Canete said that investments in renewable sources were worth more than $329bn last year, six times the amount in 2004. But the commissioner said that Europe expects the US to stay in the agreement. Away from the conference the former French President Nicolas Sarkozy has been calling for a carbon tax on US goods if President Trump follows through on his promise to walk away from the Paris deal. "Donald Trump has said - we’ll see if he keeps this promise - that he won’t respect the conclusions of the Paris climate agreement,” Mr Sarkozy, who is a candidate for next year's French presidential elections, told the TF1 television channel on Sunday. Delegates in Marrakech though were cool on the idea. On Tuesday, the King of Morocco will welcome heads of state including French President Francois Hollande and many African leaders to the high level segment of these talks here in Marrakech. The leaders are expected to issue a call for countries to go further and faster with their emissions cuts than under their current pledges.